The top seven European truck brands must be looking to the East with great interest as the yet un-named Turkish designed and built heavy duty tractor-unit is soon to enter the maketplace, offering high levels of power, efficiency and driver comfort, together with class leading connectivity. Bearing a striking resemblance to some of the latest Europen truck designs, the name will be revealed at the IAA CV Show 2018 at the Hannover Messe, Germany, along with details of its interior featuring the generic Ford Motor Company design theme. Generous storage capacity with patented airplane type upper bunk stowage with 90 degree foldable upper bed. Fuel efficiency improvement of up to 6% and maintanence cost reduction estimated at 7%, compared to the existing Ford Cargo heavy duty truck, thanks to superior aerodynamics, powertrain calibration and technical features. The new Ford Trucks’ long haul tractor offers high levels of driver comfort and luxury items as standard in this stand alone model, due to its modern design and driver-focused approach. All dashboard functions are within easy reach and the sense of spaciousness has to be appreciated. 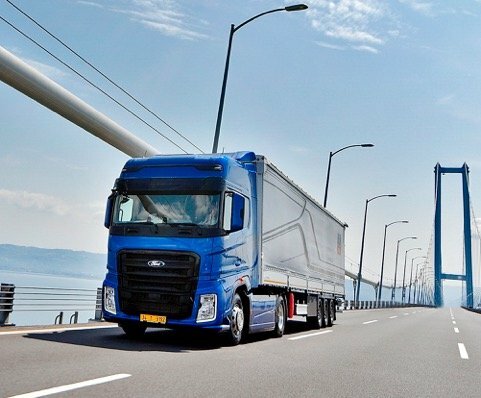 With the lower Total Cost of Ownership, smart technology comes in the form of ConnecTruck, offering a wide-ranging benefits. These include remote monitoring of the vehicle using remote diagnostic and over-the-air software. The special topographic map reading through Predictive Cruise Control enables the vehicle to analyze road conditions, allowing to drive at the optimum speed, thereby reducing fuel consumption by up to 4%. Everything from the tyre pressure monitoring system to driver evaluation functions can be displayed on the 8” colour cluster screen. The new Ford Trucks tractor-unit is a finalist in the International Truck of the Year 2019 Award contest.